(Phys.org)—The University of Zurich's Artificial Intelligence Lab is leading the way to the delivery of Roboy, an advanced humanoid, which has a due date for saying Hello World in March. Similar to the Japanese initiative of developing robots that can assist people in daily living, this robot is designed to emulate humans and help out in daily environments. Roboy is the work of engineers at the University of Zurich's Artificial Intelligence Lab, according to design principles developed by Prof. Dr. Rolf Pfeifer, who is the lab director, and assisted by other development partners. The project has involved engineers and scientists. The team members and partners share a commitment toward continued research in "soft robotics." 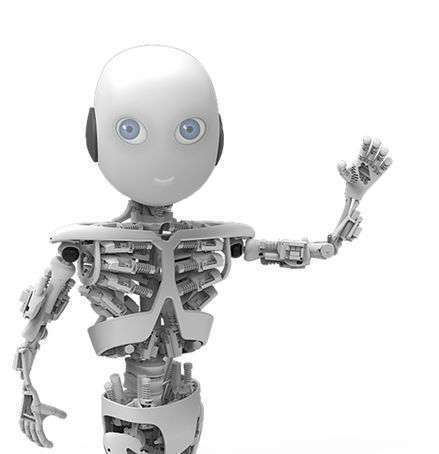 They would like to see Roboy become a blueprint for service robots working with humans, supporting elderly people, for example, to remain in independent living situations, similar to the initiatives of robot research in Japan that are focused on the needs of the aging there. The 1.20m tall Roby bears a distinguishing feature of having a tendon-driven locomotion system, in that Roboy is built based on tendon-controlled motor technology. In attempting to closely replicate the functions of human tendons, the team has been working on "radical artificial tendons" that can make Roboy move in a human fashion. A tendon is the flexible cord of strong fibrous collagen tissue attaching muscle to bone. Muscles move joints; when a muscle contracts, it pulls on a bone. The tendon structure transmits the force from muscle to the bone for joint movements. The researchers in turn view Roboy in a bigger picture as a potential marker in robotics research. "A robotics platform is being created to investigate and further develop the principles of tendon-driven drive technology in robotics. Regardless of whether the service robots of the future resemble humans or not, the principles applied such as tendon-driven movement will be put to use," according to a Roboy press release. Roboy will be unveiled at the Robots on Tour event in Zurich in March, along with documentation on its development. The Robots on Tour event carries an ambitious subtitle of "World Congress and Exhibition of Robots, Humanoids, Cyborgs and more." The event is being held on the occasion of the 25th anniversary of the University of Zurich's AI Lab. The robot is still in construction phase. The timeline for development has involved torso completion, leg development, CAD model of Roboy in its entirety, assembly, and Roboy learning to move. As of mid-December, the team's press release said that Roboy "is getting a new face and can already move his arms." Later in the project Roboy will be covered with "soft skin" to make the robot more comfortable to the touch. Supporting the race to introduce robot in March is the group's financing model. They are attempting to raise funds for producing the Roboy by selling logo space on its body, where names or company logos will be engraved onto the Roboy. In addition to partner support, the AI Lab is turning to crowd-funding. This is what I want. A semi large robot, fully programmable i.e. access to the source code, preferably open source. The ability to modify hardware with relative ease such as attaching extra components like cameras, night-vision, infrared etc (possibly access hardware for upgrades such as CPU). Then a community that develops code to make the machine more intelligent or other improvements such as a shared cloud based object recognition brain would be nice albeit slow. And all this for a reasonable price. I predict that the day they release an anatomically correct version sales will skyrocket and prices will plummet. And in a more serious vein, I am absolutely looking forward to an open source version. If you are interested in humanoid robots, then watch the sci-fi TV series known as Real Humans (Äkta människor). It's from Sweden and is a brilliant insight into how robots may integrate into society, and how humans may abuse them as well!!! Open source is not the way to go for robots working with humans. Too much opportunity for abuse. Whereas I think Roboy is still a primitive android hardware frame, it is primarily noteworthy because it will spur further advances in android engineering. It is predicted that in 5 years androids will be able to beat humans at soccer. If this seems unintuitive, remember that technology is advancing exponentially, not linearly. In a decade laptop computer will have the processing power of a human brain. The Singularity is coming. BTW, expect significant human intelligence augmentation (i.e. synthetic neocortex extenders), and AGI smarter than the average human in two decades. LOAR means the smarter humans and AI gets, the faster technology will accelerate.